LOS ANGELES - Nov. 14, 2017 -Sleep Tight, an adrenaline pumping arcade-style, twin-stick shooter with base-building elements, launches for Nintendo Switch and PC in Q1 2018. Sleep Tight will be the debut project fromWe Are Fuzzy, a veteran team of AAA game developers and big-budget film VFX artists. The team is led by Maxx Burman, whose credits include Far Cry, League of Legends, Westworld, and Titanfall. Disney character artists, including Dylan Ekren, who worked on Wreck It Ralph and Zootopia, and Ubisoft designer Oscar Mar, whose resume cites the Far Cry and Rainbow 6 franchises. 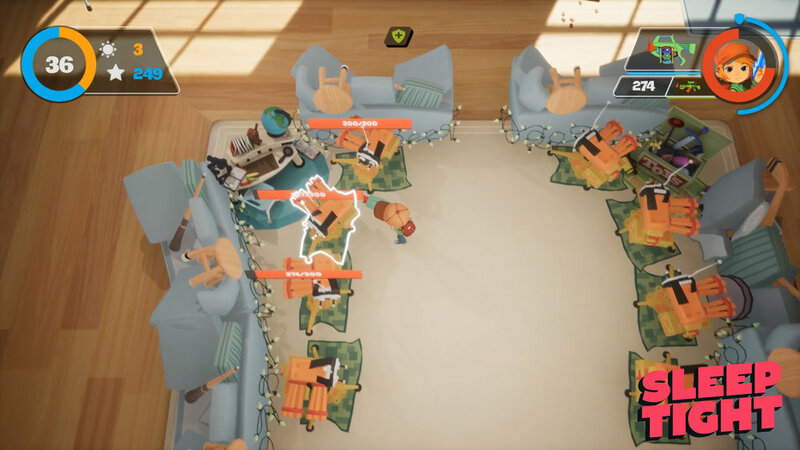 Sleep Tight draws from shared childhood experiences to deliver a fast-paced twin-stick shooter that marries adrenaline-pumping action with a charming world wrapped in blankets of nostalgia. Build pillow forts during the day to prepare for hordes of monsters who emerge after dark. Fight back against their relentless onslaught with dart Gatling guns, water balloon launchers, remote controlled gun turrets, and other toys. Throughout these frenetic nocturnal battles, players will collect stars from fallen enemies to upgrade their skills, buy power-ups, and unlock new weapons. "Since I was a kid, I always wanted to make games. After 10 years of working on other people's projects, it was time to make my own, and I wanted to go back to that feeling of pure play." said Maxx Burman, co-founder and creative director at We Are Fuzzy. "I feel fortunate to work with such talented artists to bring this Pixar-esque world to life. I think it's an experience that will appeal to the young at heart, no matter their age." For more information on We Are Fuzzy and Sleep Tight, visit the game's official website.